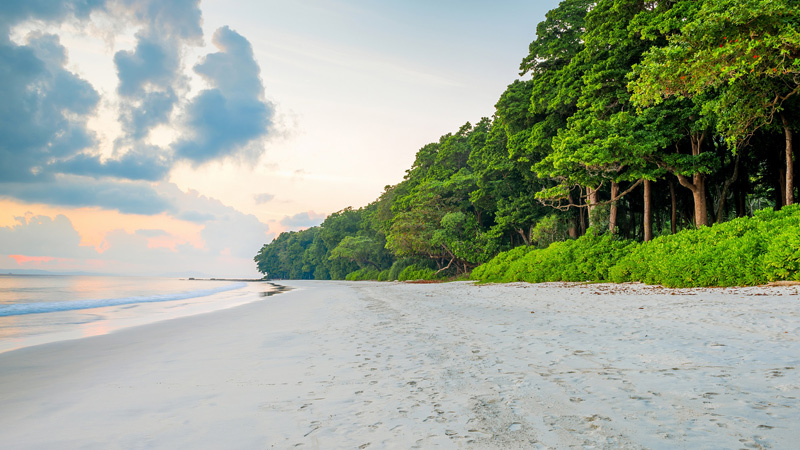 The Famous beach of legendry beauty, the pride of Andamans, this beach that is regularly splashed across magazines and travelogues is also known as the Beach Number 7. The Beach was rated as the Best Beach of Asia by Times in 2004. This beach is connected to Port Blair by regular ferries and boats. Local buses connect the Radhanagar Beach to the local villages of the island. The beauty of the azure seas is breath-taking and the beach is fringed by the ancient dark deep woods. The deep green of the forests adds an extra enchantment to the location. You can simply laze around in the secluded beach or settle down in the warm sands with your favourite book and a lazy drink. Intermittently, you can take a dip into the warm waters. At places, you will find heaps of broken shells and miniature dead corals which will fascinate you with their rich array of colours. The beauty of the beach is picture perfect and attracts a lot of international tourists apart from wide influx of Indian tourists. Radhanagar Beach in spite of being so beautiful and famous is not very crowded at any time of the year. Sometimes if you are lucky you can even see the nesting and hatching of turtles. It’s a pleasure to watch the tiny little turtles crawling towards the vast seas driven by an instinctive force soon after being hatched. As you wander a little towards the right side of the beach access point, the silence of the woods and lullaby of the waves engulf you. At some places, you find the beach a bit rocky. You can see beautiful snails, molluscs and corals trapped in the puddles among the rocks. Sometimes, the beach is alive with a flurry of small sea creatures crawling all over the rocks at these rocky points. It is amazing to watch the little shelled creatures of varying sizes and shapes and colours moving about in all directions.